A house move is usually stressful for all involved, including your pets. For most pets, the feeling of peace and security comes from being in a familiar environment with regard to the scents, sounds, and sights. These things cause your pet to become attached to their territory. This is a major reason moving houses and changing their environment and daily routine can be disruptive and distressing, resulting in a change of behavior. In addition, your own stress levels can affect your interaction with your pet, causing your furry buddy to feel even more anxious and alienated. Prepare your pet for the move well in advance by introducing them to their carrier. You can do this by placing treats inside the crate or carrier and making it comfortable by adding a blanket. This is particularly important for cats because of their fear for confinement and travelling. Dogs, on the other hand, find crates to be quite comfortable, as they know that they won’t be disturbed while lying in there, especially if they’re crate-trained. Leave packing your pet’s bedding, toys, and other supplies to the last moment so they are comforted by the presence of these familiar items. When the time comes, pack them in a separate, well-labelled box. Depending on the pet, these items could include a leash, litter box and cooper, toys, medications, poop bags, food and water bowls, crate or carrier, blanket, and fresh food and water. It might be best if you don’t clean these items for a few weeks before and after the move, as the familiar scent will help to comfort your pet. When moving to a new area, start your search for a new veterinarian as early as possible, preferably when planning your move. Also note down the phone numbers and addresses of nearby pet emergency hospitals, as well as 24-hour centers to prepare for the unexpected. Keep your pet contained and away from the chaos of the moving day, both in your old and new home. Keep in mind that all your doors will be open with a lot of back and forth movement, which might create an opportunity for your pet to escape. You don’t want to be searching for your lost pet in your new neighborhood when you’re already tired from the move. You can keep your pet contained in a crate or using a door frame gate in one of the rooms where they feel safe. Alternatively, you can ask someone to watch them or send them to pet daycare until you’re done loading and unloading the boxes. Make sure that your pet’s tag has your updated contact information, including any new phone numbers and addresses. You might also include the number of a nearby friend who can be contacted in case your pet gets lost during the move. If travelling by car, make sure that your pet is safely secured in the vehicle with a travel crate, dog guard, or car harness on the back seat. For long journeys, account for regular toilet and water breaks. Dogs have an easier time adjusting to new environments than some other pets. You can help your pet get used to their new home by taking them through a tour of the home. Walk your dog around the house, yard, and neighborhood. If you have a cat, sit quietly and pet them, and provide a safe place to hide while they acclimate. Unpack and settle in before letting your pet explore the new house so they can see familiar things in the new place. Gradually expose your pet to new areas by keeping the doors to some rooms closed. Establish a designated spot in the new home for your pet’s food and water bowls, litter boxes, and beds, and try to stick to the normal mealtime, playtime, and bedtime routines. Check the boundary fencing of your new home to ensure that it is secure, high enough, and doesn’t have any spaces that your pet can escape through before letting him loose in the yard. Pet relocation services can help to reduce the stress of moving with a pet, and even make the transition smoother for your pet. That said, adjusting to a new home will take some time, and there may be a few “accidents”. Don’t make a fuss or punish your pet, as this could make the problem worse. Instead, be patient, loving, and reassuring, and follow these tips to help your furry buddy settle in quickly and smoothly. This Weeks Project Installation in San Antonio! We Put You And Your Move First! Tips To Keep The Holiday Spirit During a Move ! Find out why we are rated as the #1 moving company in in Austin, TX. Moving to a new home is a major life event. We understand that and we make sure you feel at home before you even unpack a box. We’re a full-service moving company and a receiving & delivery experts. 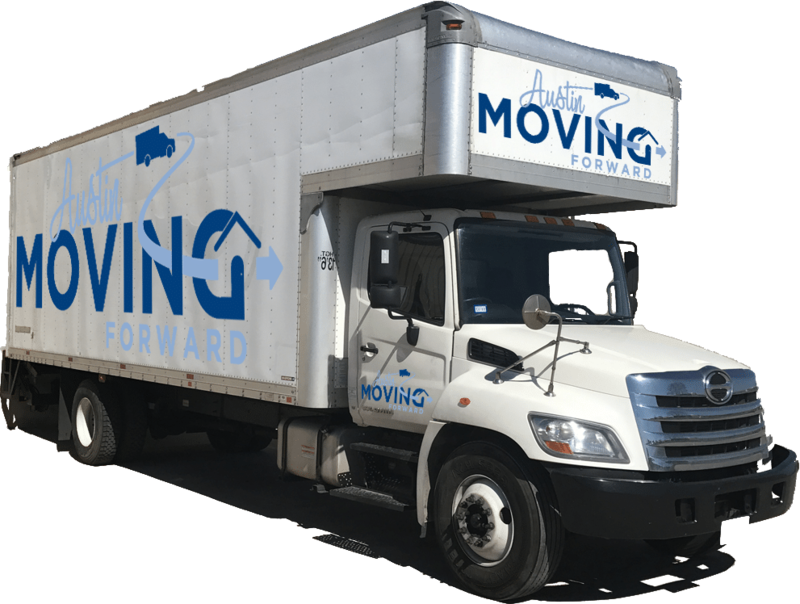 Austin Moving Forward, the only Company in Texas with an Adjustable second-floor Truck, to accommodate more space for all your deliveries.